DALLAS (Aug. 6, 2018) – An international team of paleontologists and other geoscientists has discovered the first North American co-occurrence of hadrosaur and therizinosaur tracks in the lower Cantwell Formation within Denali National Park, suggesting that an aspect of the continental ecosystem of central Asia was also present in this part of Alaska during the Late Cretaceous. This comprehensive cross-disciplinary effort has resulted in a paper – entitled "An unusual association of hadrosaur and therizinosaur tracks within Late Cretaceous rocks of Denali National Park, Alaska" – published in Scientific Reports, an online open access scientific mega journal published by the Nature Publishing Group, covering all areas of the natural sciences. "Hadrosaurs are very common and found all over Denali National Park. Previously, they had not been found alongside therizinosaurs in Denali. 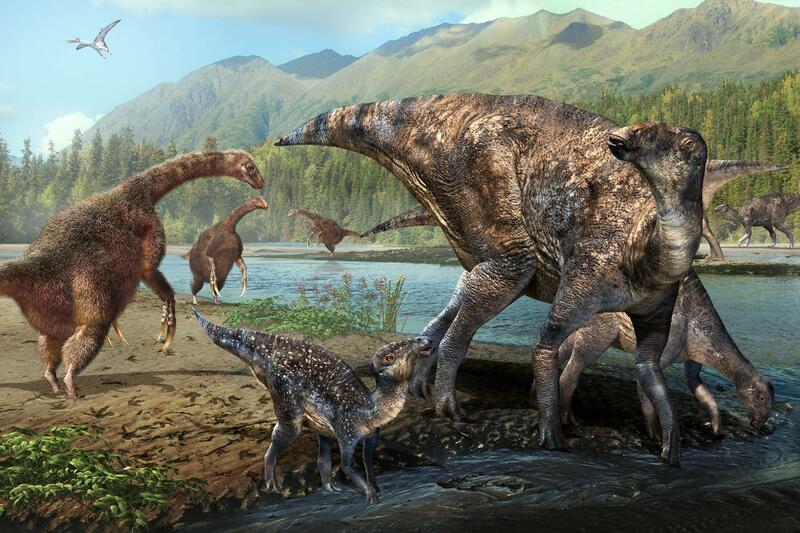 In Mongolia, where therizinosaurs are best known – though no footprints have been found in association – skeletons of hadrosaurs and therizinosaurs have been found to co-occur from a single rock unit so this was a highly unusual find in Alaska, and it prompted my interest," said Fiorillo. "From our research, we've determined that this track association of therizinosaurs and hadrosaurs is currently the only one of its kind in North America." Cretaceous Alaska could have been the thoroughfare for fauna between Western North America and Asia – two continents that shared each other's fauna and flora in the latest stages of the Cretaceous. To support the theory, Fiorillo's international team of scientists from across the U.S., Japan and South Korea worked to establish if the tracks were those of a therizinosaur and to study any unique aspects of the ecosystem. The members – including a sedimentologist, geologist, paleobotanist, paleoecologist and additional paleontologists including an expert on therizinosaurs – determined that this particular area of Denali was a wet, marsh-like environment and that one fossil in particular looked like a water lily, which supported the theory that there were ponds and standing water nearby. They suspect that both therizinosaurs and hadrosaurs liked these wetter locations.